Spirit of Old are pleased to offer a range of items which are hand-crafted from Avalonian bog oak. The ancient wood is from Somerset, considered by many to be the site of the fabled Isle of Avalon. This rare and beautiful wood is a deep, warm chestnut in colour and feels full of positive energies. 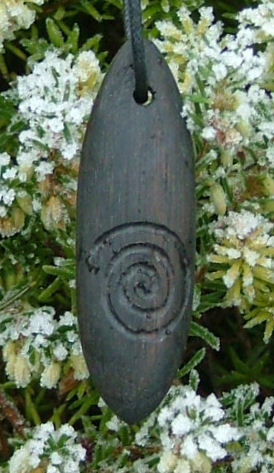 This beautiful bead is crafted from Avalonian bog oak and is carved with a Goddess. It can be purchased on a piece of thonging as a necklace or, for an additional £5, woven into a wristband from black cord thonging for a chunky wristband or deep brown flax for a thinner one (while stocks of flax last). Please note: The main and bottom left pictures show the bead for sale and the bottom right picture shows an example of a wristband with a different bead. This wonderful pendant has been crafted from Avalonian bog oak, originating in Somerset. It is inscribed with a "Tree of Life" and is supplied with a leather or cord thong. This wonderful pendant has been crafted from Avalonian bog oak, originating in Somerset. It is carved with a spiral, an ancient symbol of life. It is supplied with a cord or leather thong. A source of immense power and energy. 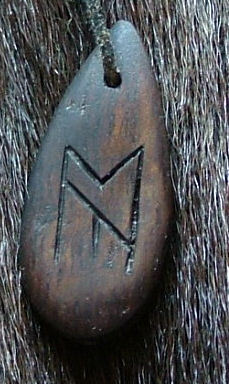 This pendant is supplied with a cord or leather thong. This pendant is carved from Avalonian bog oak and is inscribed with the Vesica Pisces symbol. It is supplied with a cord or leather thong. This pendant has been crafted from Avalonian bog oak and is carved with a Vesica Pisces symbol. It is supplied with a leather or cord thong. This petite pendant has been carved from Avalonian bog oak into the shape of a crescent moon. It is supplied with a leather or cord thong. This Neolithic-styled harpoon pendant would be perfect as a talisman for those seeking to reconnect with their primitive side or would make an excellent hunting charm. 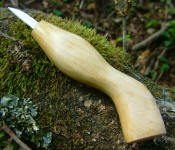 The harpoon is hand crafted from Avalonian bog oak and it is supplied with a leather or cord thong. This beautiful teardrop-shaped pendant is crafted from Avalonian bog oak. 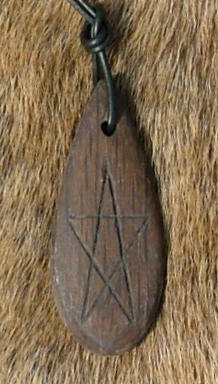 It is carved with a pentagram and is supplied with a leather or cord thong. 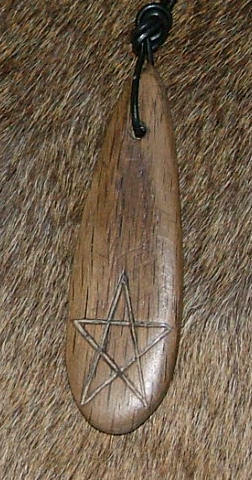 This beautiful pendant has been crafted from Avalonian bog oak and is carved with a pentagram. It is supplied with a cord or leather thong. This pendant has been crafted from Avalonian bog oak originating in Somerset and is inscribed with a Haelu symbol, an Anglo-Saxon all round good luck charm. It is supplied with a cord or leather thong. The wood is bog oak from the area of the Sweet Track, a Bronze age trackway in the Somerset Levels near Glastonbury. It is approximately 3,000 years old, is a beautifully rich colour and feels full of positive energies. It is supplied with a leather or cord thong.